I know I used this same before picture last weekend– but it is so bad- and yet I see women dressed like this all the time- that I had to show it again. Since I pointed out all the flaws last week- I won’t waste your time today. Let’s just say that there isn’t anything redeeming about this look on the right (well, except for the color combo of orange and blue- which is one of my favorites!). For a similar, yet a little more stylish look- try skinny jeans, ballet flats and a cute tissue t shirt from the gap. 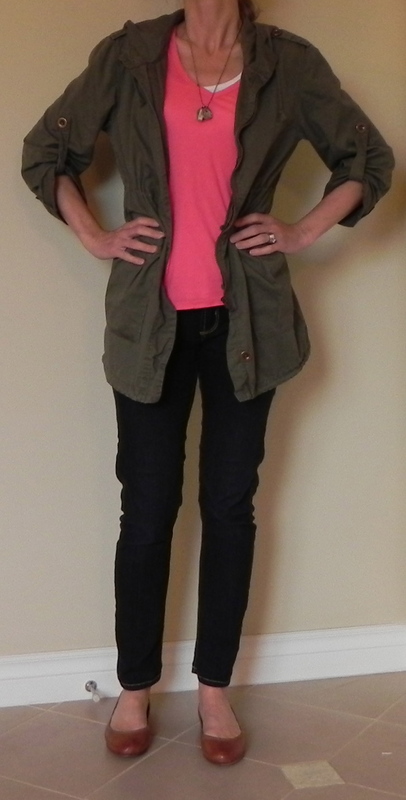 Because it’s still chilly here in the Northwest, I’ve added this cute military style jacket. I love this piece- you can throw it on for casual wear- or layer it over a dress- it’s that versatile! Best part- I bought it at Marshalls! What are your plans for today? I have NONE! Weird!! I’m not sure what to do with myself! I've got on lots of layers today- a tank, a t shirt and then this jacket.